Reading business books is one of my favorite activities. You can probably imagine how delighted I was when I received a brand new Kindle Touch as a present. This is the third Kindle I have owned since the first generation. And let me tell you – the Kindle Touch is awesome! Amazon managed to make a great product even better. It is so nice that I ended up leaving my beloved iPad at home during our last vacation. I have read over five books on the Kindle Touch in the past three weeks. While the first and second generation Kindles worked well, they lacked ‘sexappeal’. But the Kindle Touch changes that. It is a beautiful device! It is much smaller than the prior generations. It easily fits in your hand. The back of device feels slightly rubberized which makes is really easy to hold. The Kindle Touch is about as light as a tiny paperback. You can literally read books anywhere. It is actually small enough for me to put it into the back pocket of my jeans. Overall, the Kindle Touch feels very solid and well made. 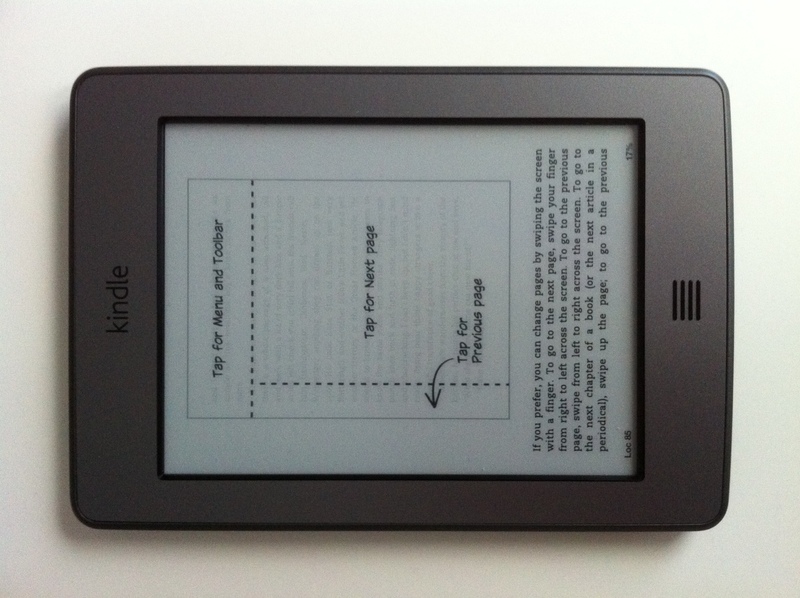 The former Kindles used to have some kind of navigational device (mini-joystick or a click-wheel) along with a keyboard. The Kindle Touch has neither. You use common gestures to navigate a book: Tap on the screen to turn a page, swipe left to go back, tap in the top of the screen to see the menu etc… It takes about one minute to learn how to navigate. Highlighting sections in a text is super-easy as well. There is simple button below the screen. It serves as the ‘back to main menu’ button (it looks like a microphone). And the Kindle Touch reacts very quickly. You can hold it with your left or right hand. No problems whatsoever. The Screen is sharper than that of the Kindle 2. Images look pretty decent. You can easily zoom in on graphics and photos by simple touching the according area. Page-turns are quick as well. Amazon has introduced a pretty cool new feature: x-ray view. It basically allows you to look at different keyword and characters and find out where and how often they occur in the book. A sparkline chart provides the information. I have used it a few times to get oriented in business books and found it very useful. The battery life is impressive. 3 weeks and 5 books in I am still waiting to charge the Kindle Touch. That is pretty awesome. Wifi is very decent as well. The Kindle Touch has connectivity when the iPad 2 tends to disconnect. Download speed of books is rather quick. Browsing on the Kindle is a ton faster than it used to be on The Kindle 2. 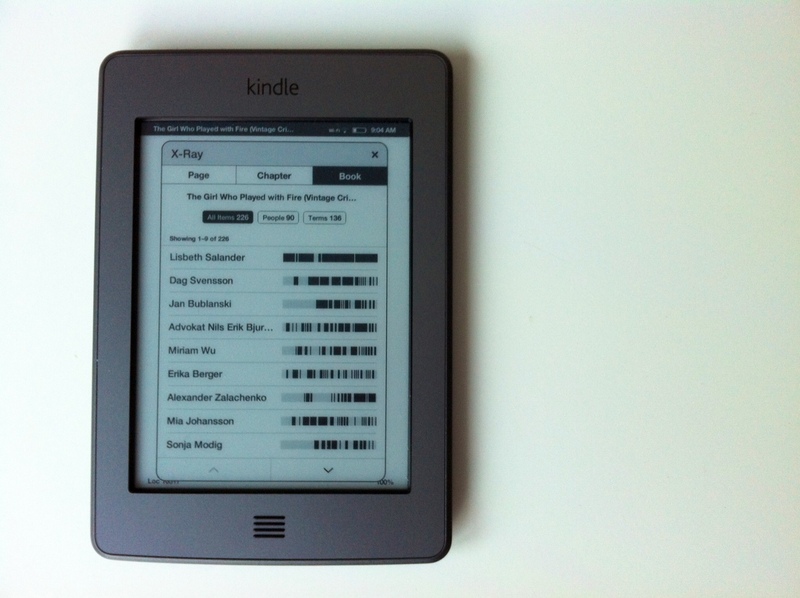 There are two different versions of the Kindle Touch: The Kindle Touch and the Touch 3G. The price difference is USD 40. The higher priced version features free 3G connectivity. The regular version ‘only’ delivers Wifi and Amazon also pushes adds out to the device. I went with the cheaper version as Wifi is all I need. The Ads do not bother me at all. They appear in the screensaver and on the bottom of the home screen. I notice them but find them to be unobtrusive. The Kindle Touch is awesome. It is definitely in my laptop bag while traveling. Reading business or other books is a pure pleasure. And the price is very decent as well. Some people have complained that this Kindle doesn’t do much beyond simply being a book reader. But I actually like that! There are no distractions, there are no email alerts and there are no incoming tweets. Perfect! P.S. : Kindle vs iPad? Read my views on that.